Nope, still looking even for a root solution. the content is calling an "exclusive file" which is downloadable only if u pay a minimum of $15 for the "Silver Membership". I created a Free Membership-account coz I am not willing to pay the amount, not yet, actually. So, the question obvious: Does somebody has a paid membership for this site and is willing to download the firmware ? But most important: Is this site even legit or (and I fear that coz the creation-date of the uploaded files seems to be strange..since the M3 lite 10 wasn´t even official released in April -or do I oversee sth?) is it just a scam-site to get the best of each customer: his cash ? It seems, that I´ve finally found the solution to extract the stock recovery, from this stubborn Tablet! I´ve extracted the update.zip with the Huawei Update Extractor which was made by the XDA-developer "worstenbrood". Thanks btw to the XDA-user "bovirus" for the pushing advise to this great and simple Win-Tool. How ever, u can find the stock-recovery.img on my [ Login / Register at the top-left corner of this page to download] . Here´s a screeny, jfi, from the OTA, which has the endnumber ..021, which is the newest update. I´m rly hoping that´s the file u needed but If u need more, infos/files. Just let me know. Ah, btw, just because I don´t know if the "RECOVERY.img.header"-file is necessary, I´ve putted in the folder aswell. Because I am still on the "old" version of the ROM (bah-l09c100b018), I´ve extracted & uploaded the Stock-Recovery from the 018-ROM for safety's sake. 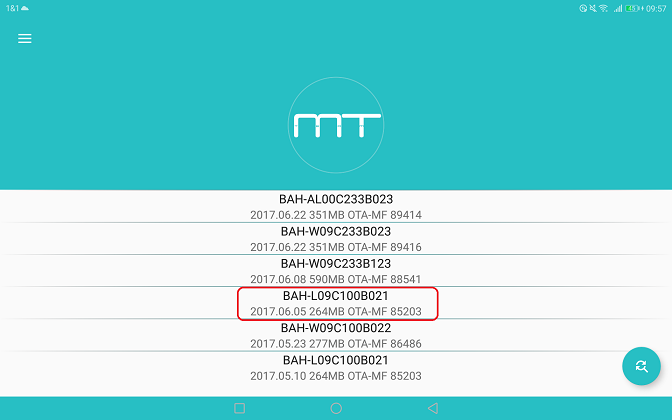 I don´t know if the "new"OTA-Recovery (bah-l09c100b021) will be compatible with the "old" (018) ROM. If needed, u can find it also on G-Drive which I´ve called "oldRECOVERY.img"
The M3 Lite 10 LTE has been finally updated to BAH-L09C100B021 (named on G-Drive: "RECOVERY.img"), only! It was quiet tricky to do so, with the Firmware Finder, but also rly easy. @All: If u wanna update ur tablet to 021, just follow the instructions from the guy below. Later I will rename the Thread-name aswell. Sth like "TWRP for Huawei BAH-L09 inclusive update tutorial" or so. Is nobody willing or able to create a custom recovery à la TWRP ? (08-11-2017, 08:42 PM)essayn Wrote: Is nobody willing or able to create a custom recovery à la TWRP ? [email protected] atm, will response as soon as I'm @home. I ´m still looking for a custom recovery. Are my uploaded files not correct or incomplete ? If so, let me know what else to need please. (08-26-2017, 10:27 PM)essayn Wrote: I ´m still looking for a custom recovery. I am willing to respond to HO (think you can see my email address). But I have a BAH-W09C100B022 not a L09 and already downloaded the stock firmware files and uploaded them to my GDrive. I also extracted the ZIP-content into txt-files - hope it helps. Meanwhile I'e extracted the UPDATE.APP-file and uploaded the content into the "B022/OUTPUT"-folder ... uploading right now. files_desc.txt is the output of a "file *" on linux - maybe it helps identifying the "unknown" files.